Artist Julia Watkins, known as "Energy Artist JuliaTM" is best known for creating powerful, vibrant, energy enhanced and channeled paintings and jewelry. She was a prodigy artist, having started graduate school art classes at the age of 16 (NC State School Of Design) and finishing up her art instruction at the Art Student's League in NYC where she studied under some of this era's greatest portrait painters. Of interest is that she supported her art studies back then by becoming a known international model and also received a degree in computer science (University of Texas), specializing in artificial intelligence. She was a member of a small team that developed the AI and graphics for the F16 fighter jet. While she had the career option to make a steady living as a portrait artist, Ms. Watkins felt a higher calling following a powerful dream she had in September 2003 and began focusing on colorful, positive energy, spiritual subjects. This decision to turn away from an easy living and start a new form of art was not without consequences. For 8 years she traveled the US with her husband, entrepreneur Spencer Kluesner, living out of a van and trying to gain acceptance for "Energy Art" selling at outdoor art fairs. This near homeless life came to its conclusion in 2011 when thanks to a number of supportive patrons, she was able to open her energy art and jewelry studio near Vail, CO.
Ms. Watkins is best known as the founder of the Energism Art Movement where artists focus on creating works that project positive spiritual energies to the viewer. 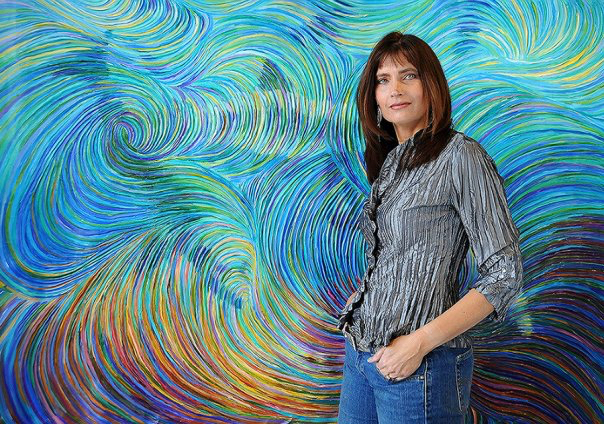 Her artwork is in the collections of Carnegie Mellon, Longview Museum, Children's Hospital and Deepak Chopra. She is represented by noted licensing agent Suzanne Cruise - Cruise Creative.